All week I have been thinking about the women who shaped my life. I can trace the parts of myself that attach to each and every female who has influenced who I have been at times in my life and who I am now as I become the age many of them were when I recall them most clearly. I have grown up surrounded by wonderful women, beautiful, intelligent and unique; each of them has left an imprint on my mind, my sense of place in the world and my way of being. Many of them have been responsible for why I love clothes books and baking. I have just put a cake in the oven, my pile of sewing is ready to be tackled, I have French café music playing in the background, as I begin to smell the warm almond aroma that escapes from the oven I am struck with how I have refashioned the Sundays of my childhood and recall the love I felt for the woman who inspired me to create this version of myself. This version today, my sewing-Sunday self, is a tribute to my godmother Ursula. Her home was a sanctuary for me, a place where I learnt to sew, to make cakes, to paint. 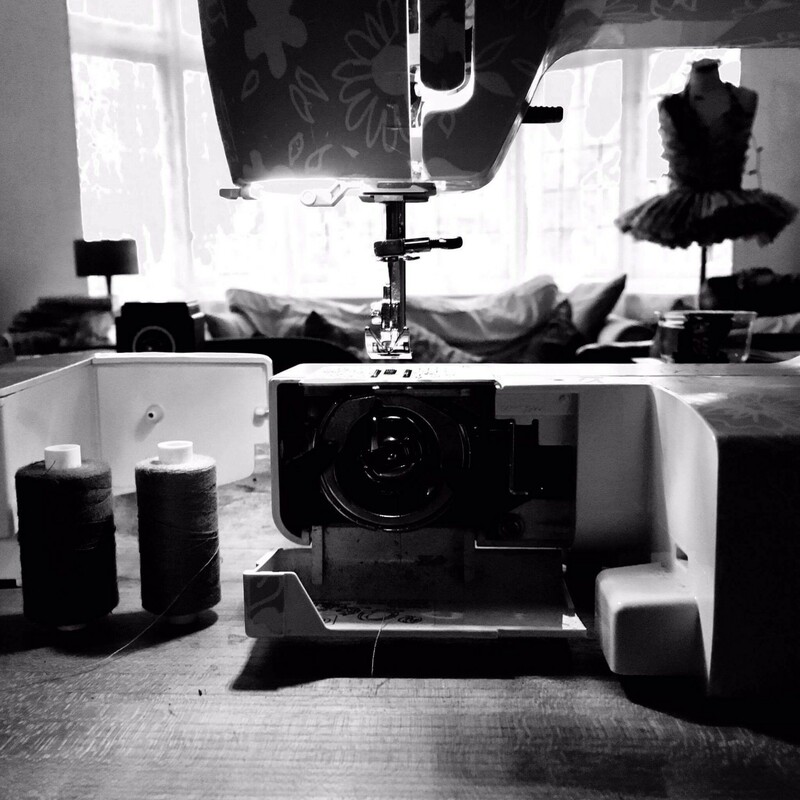 I remember with all my senses the feeling of sitting on the floor in her sewing room playing with the fabric scraps, the hum of her sewing-machine, the sound of the radio, the smell of cloth as it heated up from the speed of her stitching mixed with machine oil and the endless cake-smell that emitted from her kitchen . She worked as a home-machinist, a piece-maker, paid for the completed garments she could sew each week, speed was vital to make the job worthwhile. I found it a great adventure to collect the pre-cut fabric shapes from the strange man down the road and then return the blouses, skirts or dresses to him the following week. Ursula had a wicker trolley that conveyed the fabric back and forth, it had a vinyl elasticated cover to protect the pieces from the rain but in my head converges with the plastic cover that she threw over the budgie’s cage to to stop it talking. I was as equally fascinated by a chattering bird as the flat bits of coloured stuff which could make something we could wear; it was all magic to a six year old. And she taught me how I could do it myself starting with dresses for my dolls, stitched from the scraps leftover from the outfits she made for me so that we, Tiny Tears and me, often had matching ensembles. If I close my eyes I can vividly remember frocks made from classic 1960’s prints, shiny bright orange flowers on a pink background, yellow, lime green and turquoise striped terry-towelling, chocolate brown and cream ‘fake Laura Ashley’ ditsy print long dresses and copies of Biba purple hotpants. There was always something new to wear, it was fast fashion made at home. The women in my childhood, my mother, sisters, aunts, always had a project on the go, stitching, knitting, crochet, a bit of macramé. They would see a garment in a magazine make a pattern, buy a couple of yards of fabric or raid each other’s material stashes, and be wearing a new outfit sooner than it would have taken them to travel to the West End and buy it. Clothes would be reshaped and embellished as fashions changed, hand-me downs were adapted to fit changing bodies and tastes; there was a constant sense of sharing and community that evolved around clothes. I see an outfit now and have an image in my head of my sisters wearing the original inspiration for it. My childhood shaped my aesthetic taste but more than a superficial love of clothes I developed the understanding that it was easy to do it yourself, that whatever was going on in ‘fashion’ could be followed with a personal twist at home and that there was an idea that we dressed and created for each other. A women’s collective of creative endeavours which supported female lives, sewing was a way to be radical, to say I can do it my way, to be whoever I want to be, I grew up believing I could fashion my own identity from whatever happened to be lying around. Twigg (2014) considers: ‘Identity and dress are intimately linked. Clothes display, express and shape identity, imbuing it with a directly material reality’. I feel that connection with forming who I am by the way I dress, this woman you see is who I choose to reveal to you based on the clothing choices I make. And I make those choices based on the experiences I have absorbed into my wardrobe from the women who have influenced my sartorial sense of self. Ursula was one woman amongst many who had a sway on why I dress as I do today. As a psychologist who is interested in clothes (or a fashion researcher who is interested in emotions) I am intrigued to understand if this knowledge is useful to me. Does it matter if I know where my visual sense of self comes from? What relevance is it to anything why I create emotional relationships with my clothes? Does this awareness of having a relationship with my clothes, a deep attachment to knowing who I am and how I express myself sartorially, have an impact on the amount of clothes I buy. If we are satisfied with how we feel in our clothes, not looking to constantly meet internal needs with something new, then would we naturally consume less? Does individual flourishing fashion translate to a way in which the fashion system could change? That may seem a huge leap from the start of this piece that expresses gratitude for one woman that created idyllic Sundays for a small child. Ursula’s impact on who I am is not merely to do with how I dress; she taught me to think for myself, to choose whether I wanted pink or purple, shiny or matt, fluid or stiff, and the confidence that knowing how to cut cloth to suit my needs has rippled out into values that express how I shape my view of the world. I learnt that changing the depth of an armhole in a paper pattern transformed the whole drape of a dress just as I absorbed the knowledge that when we take responsibility for deciding how we conduct ourselves impacts on what kind of life we live. Ursula taught me that I have a choice. That is a hugely valuable lesson for a child to acquire. For that I will be ever grateful. That and the ability to French seam.